...which is tucked behind the drawer. The top left drawer is shortened to make room for the hidden compartment. 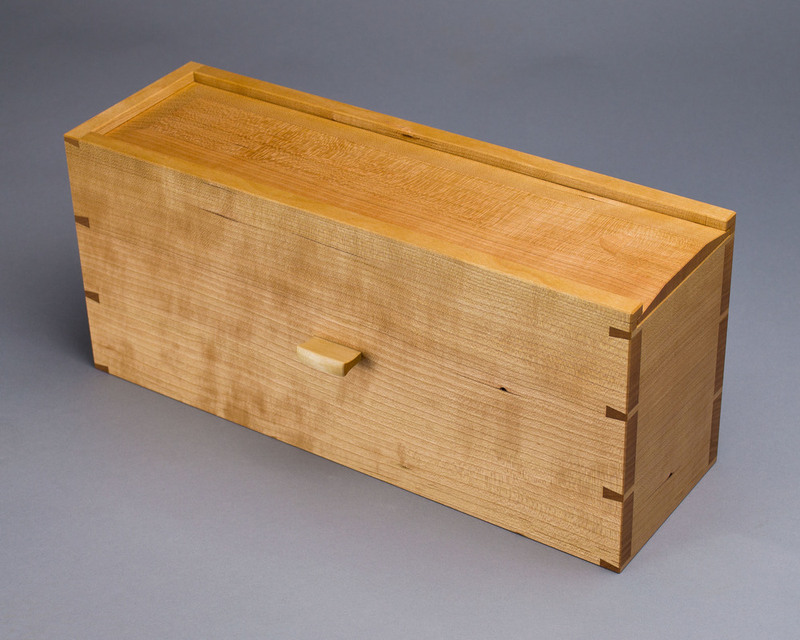 The hidden compartment, a dovetailed box made of quartersawn cherry. 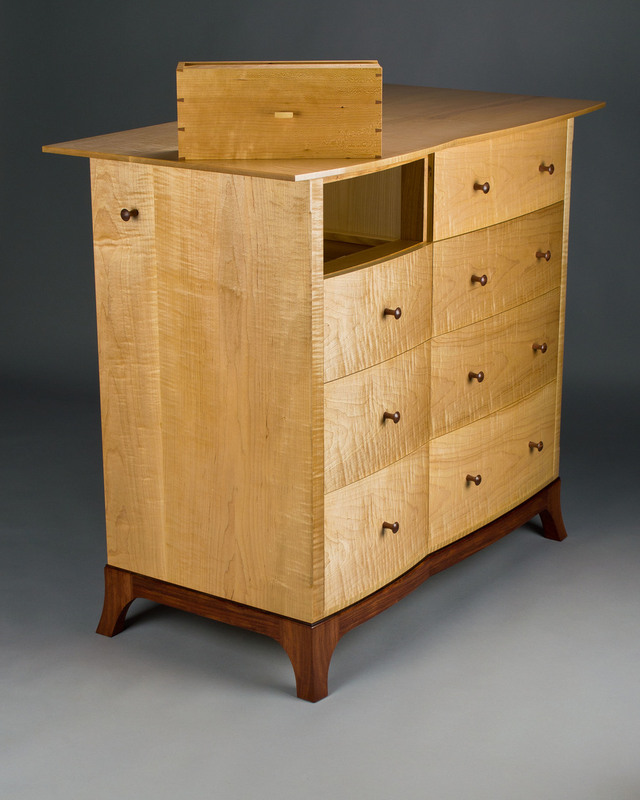 The top of the chest is curved to mirror the curves of the drawer fronts. 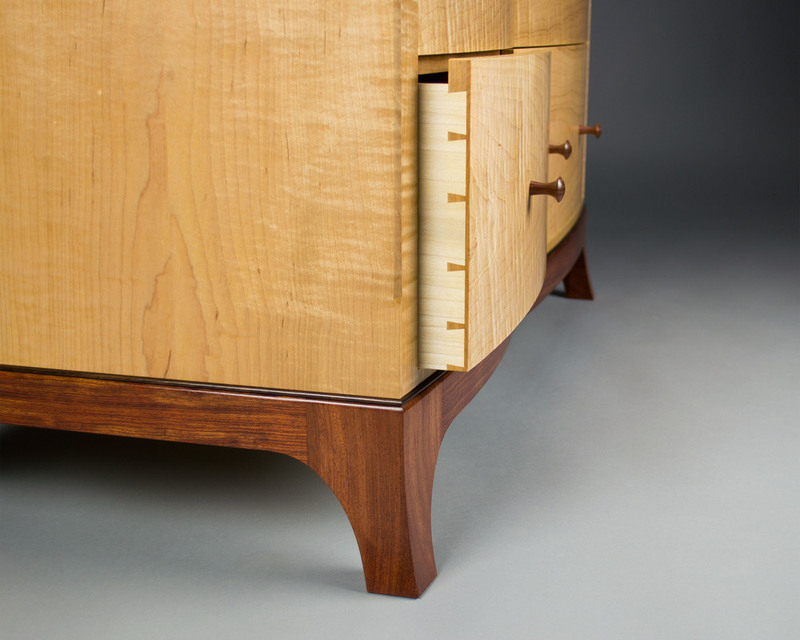 The bubinga and rosewood base is shaped to mirror the curves of the drawer fronts as well. Bubinga was used for the turned knobs, which are secured to the drawer fronts with wedged through tenons. 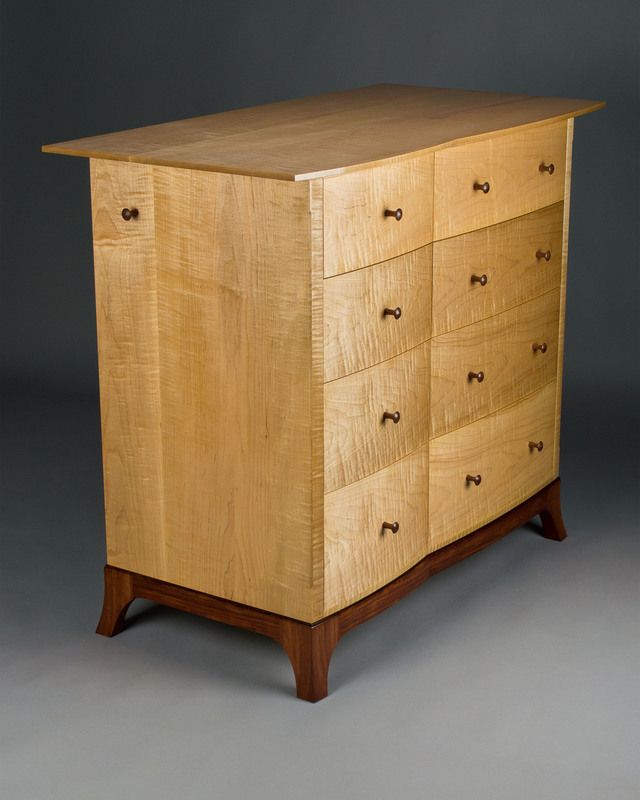 This recently completed chest of drawers is made of curly maple, bubinga and rosewood. The drawer fronts are curved, a different radius for the right side versus left side, and the top and base are shaped to mirror the curves. Why call it Caché? The pictures explain...click on any image to open a slideshow. ...because if you can't draw it, you can't build it. The base, before adding the bead. The corner gussets are Douglas-Fir, with spruce glue blocks to stiffen everything. It took a lot of shaping of wood with rasps, files, chisels, spokeshaves to get to this point. The mighty little scratch stock. A piece of steel and a piece of cherry. Cut a shape into the steel. Insert it into the cherry, and we're ready to scratch beads. Sometimes the biggest challenge is holding the work. The rosewood bead stock is too small to hold comfortably. Temporarily held to the pine board with double sided tape, I can now clamp it in my vise and easily work the rosewood. Scratching a bead in rosewood. A rosewood bead. It still needs a little cleanup: sanding and hand planing to thickness. Gluing the bead to the base. Miter, glue, clamp and nail. Repeat. A slow process. The finished base with rosewood bead. The chest of drawers is coming along swimmingly. I have posted some images to illustrate how the base was made. Unfortunately there were media blackouts during the process, so images of some steps are missing. Many steps, actually. And there wasn't really a media blackout. I just forgot to take pictures. I find that I really have to think about photographing the process, or else I get completely immersed in the work and forget to stop and take pictures. Sometimes I also forget to stop and smell the roses. What I am able to show here is how making the base started with a full size drawing. At this point, any existing drawings are pretty much useless as I have to work off the reality of the piece. So I placed the case on a sheet of paper (from a discarded roll of plotter paper) and traced the outline. This gave me the footprint of the case, with no measuring, no transferring dimensions or angles. Pretty quick, simple, and accurate. From there, I drew the footprint of the base, including the joinery to connect the aprons to the legs (free tenons) and the joinery to reinforce the miters (splines). I could then use the drawing to determine the lengths of the aprons, location of mortises, etc. 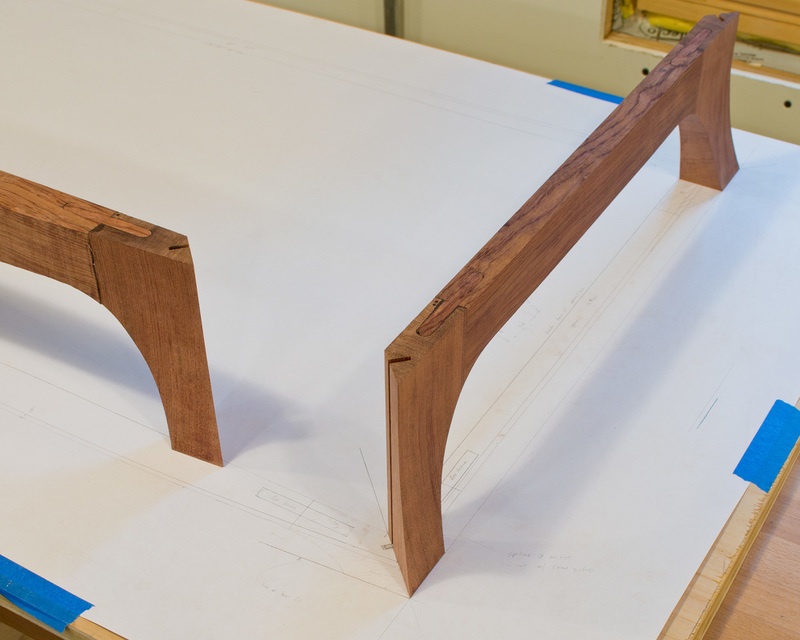 What I didn't provide photographic evidence of is the process of creating the bubinga base. In a nutshell, I did as much work to the legs and aprons as I could when they were still rectangular parts - milling to size, routing mortises, cutting miters, roughing out the flare in the legs. Then I glued together the leg-apron-leg sub-assemblies and cut the curves where legs meet aprons. Then it was a lot of shaping with rasps, files, and spokeshaves to fair the aprons into the legs. 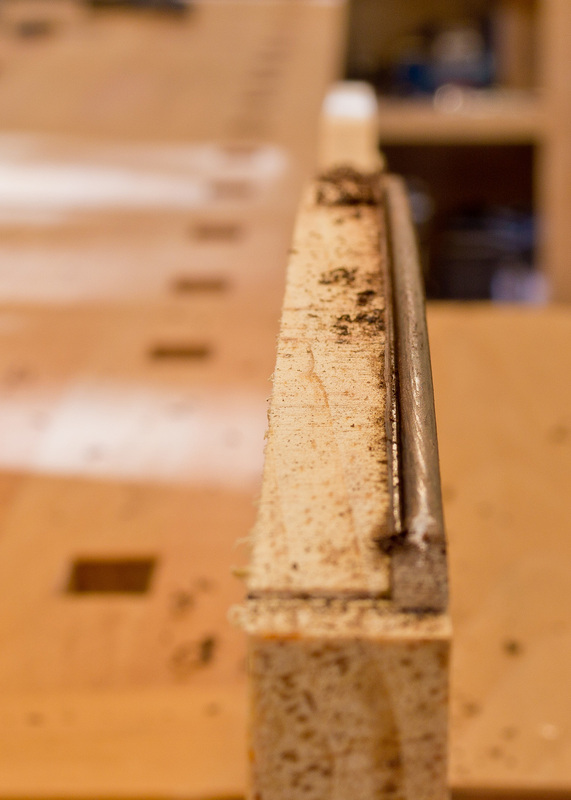 Then assembly of the the entire base (the splined miters), adding gussets and glue blocks, a bit more shaping of the legs to refine the miters, and shaping of the top edge of the base, where it transitions into the bead. From there, I think the photos can take over.